As you will see from this photograph, I have the most beautiful lavender growing at the moment. I have not wanted the flowers to go to waste and so I have harvested them for lavender petals, lavender sugar, and my infused honey. When I recently found some Turkish figs at the shops, I decided to make a creative dessert using the honey, and my crumpet mixture. I keep this in my pantry and add the wet ingredients when I have the whim to make crumpets. It is flowering like mad now! It looks and sounds utterly delicious! 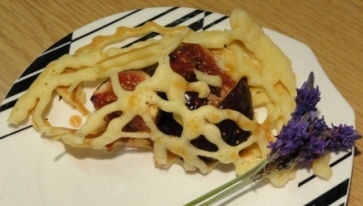 What a fantastic idea of how to make a ‘lace’ crumpet! I love it…and is certainly visually attractive! I have tried lavender infused honey would by the sounds would be delicious! A great dessert!